Krzysztof Kieslowski’s Dekalog is one of the most unlikely masterpieces of world cinema. Created for Polish television under the watchful eyes of Communist censorship, it has a daunting 10 hour runtime. And the subject matter doesn’t seem particularly promising either – each one-hour episode revolves around one of the Ten Commandments. But Kieslowski and his collaborators make the Biblical themes feel compelling and fresh. Set in a modern apartment complex in Warsaw, Dekalog uses the stories of the residents to examine moral lessons such as “Thou shall not steal” and “Honor thy father and mother” from odd and oblique angles. These complex stories prove consistently engrossing, reminiscent in tone of Ingmar Bergman’s work, but with added metaphysical wrinkles. 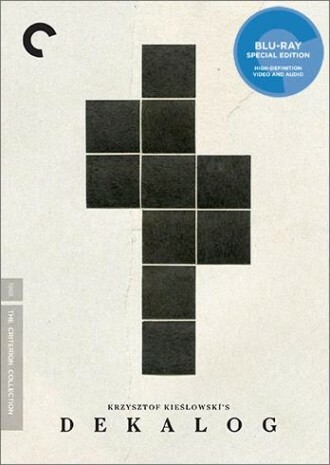 The recent Criterion Blu-Ray box set collects all ten Dekalog episodes which have been beautifully restored from the original celluloid prints. Two of the episodes were expanded into theatrical films – A Short Film About Love and A Short Film About Killing – and those are included as well. There’s also a disc of extras featuring new and archival interviews, and a program tracing the work’s thematic connections and formal patterns, including the recurrence of a mute character who appears as a witness in key moments. Although the episodes share the same setting, and some tenants make brief appearances in each other’s stories, they’re designed so you can watch them in any order. Or you can simply treat them as one-hour films that stand on their own. There are a number of mini-masterpieces here: Episode Two about a wife’s unexpected pregnancy and her choice between her lover and dying husband; Episode Four about a daughter’s incestuous yearnings for a man who may or may not be her biological father; Episode Eight about an old woman forced to confront her actions during World War II; and Episode 10, a comedic romp involving two brothers who inherit a valuable stamp collection from a father they barely knew. Then there’s A Short Film About Killing – an expansion of Episode Five – a hypnotic and brutal examination of senseless murder and state-sanctioned capital punishment that’s one of the most stirring films ever made about violence. Throughout Dekalog, Kieslowski worked with the same co-writer, editor, and composer, but he smartly assigned different cinematographers to each episode so there’s a wide variety of visual styles. Although it was made for television in 1988 in an Eastern Bloc country, the series feels far more cinematic than anything being produced in the U.S. today. Fortunately, we weren’t reliant on the marketplace to decide whether viewers needed to see Dekalog. Another moral lesson. “It does not matter who my father was. In D. Foy’s new novel, the father is more than a male parent. He’s a larger than life figure, a consuming idea with many manifestations, a tar pit trap that threatens to entomb any child who crosses its path. Patricide explores a boy’s attempt to extinguish the father’s influence and his corrosive masculinity. It’s a remarkably timely story given our current toxic political climate. And it shows how truly difficult it is to kill the bad father. The main character is Pat Rice (the book’s title minus the “id”), who struggles to escape his abusive home, feckless father, and malevolent mother. The family encounters often play out with a visceral force reminiscent of John Cassavetes’ films. 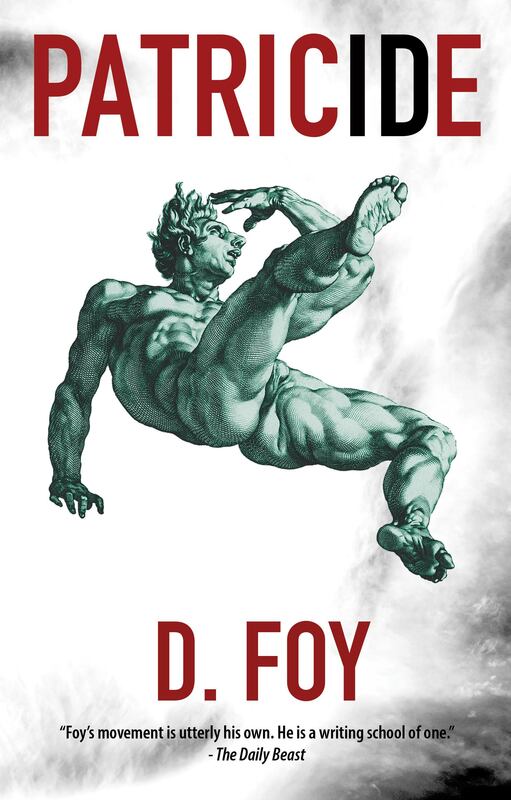 Foy places readers at the center of these turbulent confrontations, witnesses to the characters’ compulsions and bad choices. As you turn the pages, unable to look away from the compounding damage, a radical empathy accrues for these battered people. What’s remarkable about Patricide is how these scalding scenes are presented within an inventive and rigorous narrative framework. Each of the novel’s 12 sections recount Pat Rice’s story in a different mode, changing up the tone, style, and even point of view. It’s a complex form more commonly found in European fiction. There’s a long lyrical meditation on getting high for the first time, an emotional letter from the father, a harrowing bender that ends in violence, and even a fable. Foy trusts his readers to shift gears and embrace this kaleidoscopic structure and repays them with an engaging narrative etched in taut prose. Patricide is a primal howl of a novel that slowly – as your ears become attuned – sounds like a classic aria. There are many books out there collecting Raymond Pettibon’s work, so let’s cut to the chase: Homo Americanus: Collected Works is the best on the market. It’s a Platonic ideal of an art monograph, offering a career-spanning selection of his best drawings, each one beautifully reproduced at a large size, with minimum commentary. But Collected Works? Not even close. 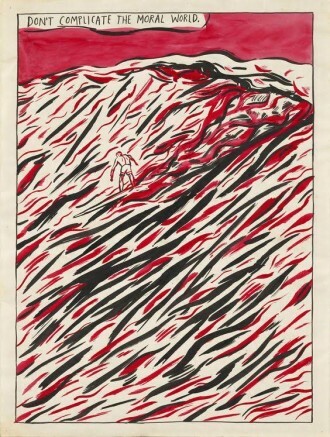 Since he started in the mid-1970s, Pettibon has created almost 20,000 works on paper. Still, this 700-page brick of a book offers a generous sampling. In fact, it’s so big the binding begins to crackle the longer you turn the pages. 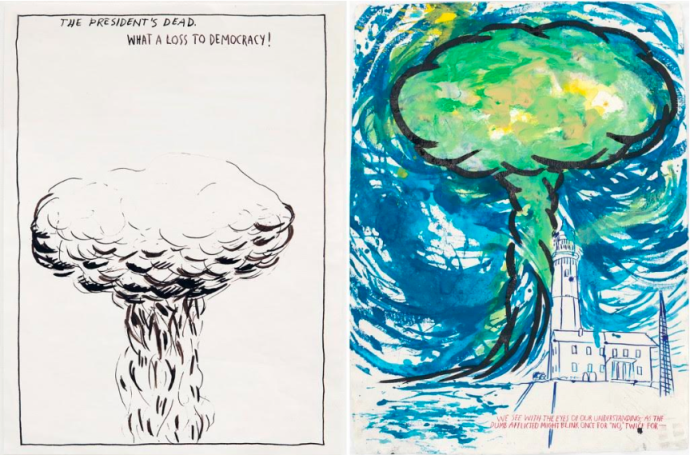 Pettibon first gained notice for his startling pen-and-ink drawings for Black Flag and other seminal punk bands in the 1980s. He used the combination of visuals and text to subvert the mythologies of American culture. His work has obvious surface affinities with comic books, pop art, and punk rock, but as you dig deeper he seems closer to the spirit of Goya and William Blake. Homo Americanus includes his first major work, the 68-page book Captive Chains, a selection of concert fliers and record covers, a sampling from zines such as Tripping Corpse, American Lynch Law, and Exterminating the Eagles, and more recent paintings and collages. It’s broken into 32 chapters that showcase his key themes, such as Helter Skelter, Gumby, Easter Island, The Bible, Fire, Trains, Surfers, Mushroom Clouds, One-Liners, and Erections. 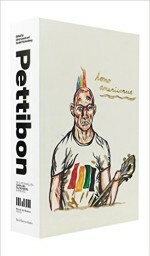 Each chapter is introduced with hilariously grouchy and illuminating commentary by Pettibon himself. He talks about how his library serves as his main inspiration, and the longer you look at his work the more it proves extraordinarily erudite. The drawings are filled with allusions to literature, history, sports, politics, music, and film. 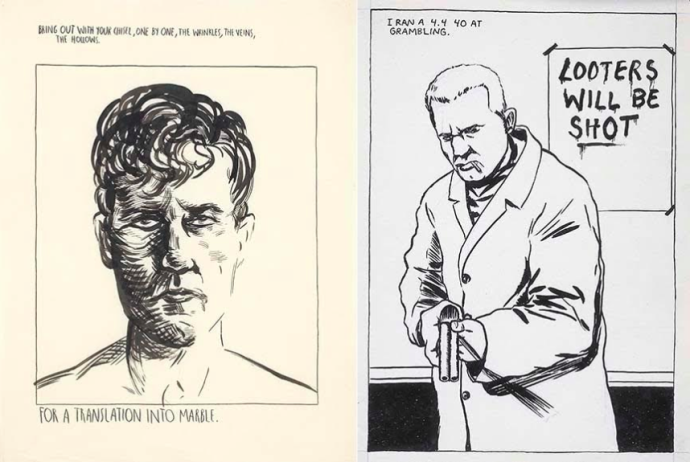 Raymond Pettibon: A Reader reveals his wide-ranging tastes which include works by Alice James, John Ruskin, Thomas Carlyle, H.L. Menken, Stephane Mallarme, Mary Baker Eddy, Lawrence Sterne, and Mickey Spillane.